“We’ve come a long way from the coffee shop,” says IPR’s Music and Entertainment Business (MEB) student, Francisco Gonzalez. This year his company General Admission is running the now-annual show, Buckfest on June 10th at the Cabooze in Minneapolis. 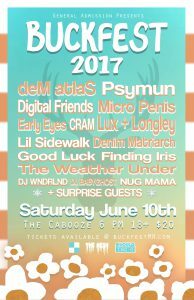 With a lineup of varied artists including Rhymesayer recording artist deM atlaS, the show looks to be taking it to the next level. “Many shows usually focus on one genre or one artist,” but according to Gonzalez he has made genre busting the focus of Buckfest this year. Gonzalez started working on the show in January and continues while he finishes his classes this quarter on his way to graduating in June. The main thing for success according to Gonzalez, is the focus. “It’s all about the vision, otherwise it’s like any other show.” Other advice for anyone trying to do this? “Have your network in a good place. “You can’t do it alone.” he stressed. The young promoter has learned that it’s necessary be good at developing contacts and relationships with others in the music industry. At 20 years old, he already has a history in the business. In 2014 he started Buckfest staging two shows with high school friends at the Depot in Hopkins and he put on a third at the Garage in Burnsville. In 2015, it was at the Fineline in Minneapolis with multi Grammy nominee Allan Kingdom on the show fresh off appearing on Kanye West’s single All Day. Gonzalez found a lot of support from established artists, like Kingdom, along the way. “I’m grateful that people ‘higher up’ than me gave me the time of day,” said Gonzalez. “They know how important it is that the Minneapolis music scene grows. It shows that they care and they know how tough it is to work your way up.” Last year, Buckfest 2016 brought the show to Mill City Nights in Minneapolis with headliner Bobby Raps – producer for this year’s The Weeknds‘ 2017 release. You would think the music is enough to keep him busy, but Gonzalez is branching out to establish General Admission as a lifestyle, music promotion and clothing brand. 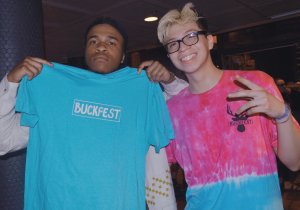 For the second Buckfest, he designed shirts and sold them to concert goers. With the concert information printed on the back, it was a natural marketing tool that created a fan base. That started an interest in designing and selling apparel. Now he likes to focus more on design and he is working to solidify his clothing brand. Click here for tickets for the 2017 Buckfest.